Whether it's slugs, aphids, carrot root fly, rabbits or birds causing you sleepless nights, we have compiled a rogue's gallery of the top 10 grow your own garden pests. Often identification is the most difficult part of the conundrum and getting to the root of the problem is easy once you know which pest you are tackling. Once you’ve thumbed through our pest list or have a fairly good idea who - or what - is responsible, our easy to follow, pest-by-pest listing of organic control measures - all perfectly safe to use around children, pets and wildlife and kind to the environment - will lead you to a suitable answer. The gallery includes pest identification photos and a host of treatments to remove them, putting an end to your garden pest problems the eco-friendly way! If you are struggling to identify the pest plaguing your garden then put our expert Kitchen Gardener Jo Blackwell to the test. Jo encounters the same pests and diseases as everybody else in Stephanie’s Kitchen Garden. So for advice on any gardening problem, put our Horticultural Expert Jo Blackwell to the test, we are confident she can help! You can view the question and answer archive to see if other customers have experienced the same pest invasion and how they dealt with the problem. 1. Slugs. Slugs and snails have one thing in common – they want to eat your plants and as long term top three in the RHS Garden Pest List pest charts, slugs and snails will happily munch through most vegetable and plant seedlings which emerge in the garden. 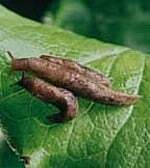 Apply Nemaslug Biological Slug Killer to the soil. 2. Snails. All the various products designed to catch, kill or prevent slugs and snails from destroying your garden in the Harrod Horticultural pest range are all organic. There's absolutely no threat to children or pets, birds and hedgehogs which feed on the slimy creatures will not be harmed and no nasty chemicals will be introduced to the food chain. Apply Advanced Slug Pellets to the base of plants. 3. Birds. Capable of repelling the smallest of birds without trapping them in the net, the high quality, strong and durable black netting is also used as fruit cage netting for the roof of our cages. Strawberries and other soft fruit are protected by temporary or permanent fruit cages covered in bird netting. 4. Caterpillars. Caterpillars are to be admired in a strange sort of way as sometimes you just have to hand it to Mother Nature; if we could sit down with all the 21st Century technology available to us and design the ultimate plant-destroying machine, the chances are we'd come with a caterpillar - and the larvae of the both the Large and Small Cabbage White butterfly is arguably the most ravenous of all, leaving many a brassica grower staring at a skeleton of a cabbage, Brussels sprout or broccoli plant! And it's not just vegetable growers who suffer at the jaws of these voracious larvae; fruit tree fans will be horrified to hear that the larvae of the codling and plum moths are very keen to eat their way to safety in the middle of developing apples and plums, making them very difficult to eradicate. Low lying fruit cages protect brassicas using butterfly netting. 5. Aphids. Aphids may be better known as greenfly or blackfly but the alias doesn't disguise the fact that this pest family is one ofthe biggest on the allotment, in the vegetable patch or anywhere in the garden for that matter. To give you an idea what the gardener is up against, there are over 500 aphid species in the UK and northern Europe of varying colours and shades; although some are restricted to individual plant types and families, others will feed on literally hundreds of unrelated host plants and most staggeringly of all, they reproduce so quickly that a single aphid could potentially introduce ten million tonnes of offspring in one summer! Spray plants with Insect Killer Spray. 6. Whitefly. Whitefly are the scourge of greenhouse gardeners, the presence of which is indicated by white scales on the underside of the leaves and quite often, a white cloud of flies will take to the air if an infested plant is touched. Affected plants can develop viruses and sooty mould as the sap-sucking experts secrete honeydew onto leaves. 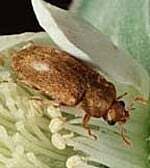 It's not just greenhouse growers who need to watch out for this airborne pest; you'll find brassicas are equally at risk during the summer months. The hero of our organic pest control range is a tiny parasitic wasp named encarsia formosa. 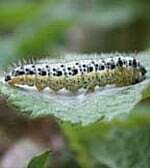 The wasp will lay its eggs directly into the whitefly scales which are commonplace on the underside of leaves; the eggs then hatch and feed on the pupating whitefly inside, turning the scale black before the adult encarsia emerges. Biological Whitefly Control is available in the summer months. 7. Carrot Root Fly. Carrot Root Fly are both stealthy and sneaky and by the time you suspect Carrot Root Fly might be a problem in your vegetable patch, allotment or kitchen garden, it will probably be too late! The creamy white larvae are only around 10mm in long but can cause extensive damage to carrot, parsnips and celery if you're not prepared for them and the two to three generations or adults which zoom in under the gardener's radar each year - but with our organic range of anti carrot root fly products at the ready, you could yet end up with 24 carat carrots! When carrots are seedlings, Anti Carrot Fly Screens are set up as a physical barrier because the carrot fly cannot fly to this height. 8. Wasps. A social winged insect which has a narrow waist and a sting and is typically yellow with black stripes. It constructs a paper nest from wood pulp and raises the larvae on a diet of insects. Wasps can cause devastation to fruit trees so wasp traps are hung in apple trees. 9. Raspberry Beetle. The 8mm long white larvae of the Raspberry Beetle is found inside the centre of the raspberry fruit! Raspberry Beetle Traps are applied from April-July to catch the beetles. When the beetles start appearing in the traps it’s time to use the insect killer spray on your crops. 10. Rabbits. First introduced to the UK by the Romans, rabbits have been plaguing gardeners and farmers ever since with their incessant nibbling of young woody shrubs, trees, commercial crops and vegetables grown in our gardens. They've got a cuddly side too however and we'd much rather supply products which deter, repel and even humanely catch these troublesome bunnies rather than cause them any harm. Fruit cages can have rabbit wire wrapped round the base and dug into the soil to rabbit proof the cage. Garden netting and protection is one of our specialist areas and as netting manufacturers for 60 years we know garden netting is a key part of the grow your own gardener's arsenal to combat nearly every pest in the Harrod Horticultural top 10 Grow Your Own Pests list above. Whether its fruit, vegetables or herbs you're growing and birds, butterflies, aphids, deer, badgers or foxes you're trying to keep out, we've got the right grade of garden netting for you. As gardeners ourselves, we know just how much damage a single butterfly, for example, can cause to a crop of cabbages - that's why we're providing such a wide range of netting, designed to protect your valuable crops from all kinds of pest attacks. The netting range is summarised in a handy garden netting guide video.